This ride is a short loop mostly through the two trails in Upper Stevens Creek County Park that I've named in the title, while also including a quick pass through Long Ridge Open Space. The "main attraction" of the ride is Charcoal Grade. This fire road is legal to bikes only in the uphill direction. Once you know that, it will not be surprising to hear that it's a notoriously steep climb. There are many other routing options in this area in which you can include this challenging climb. This particular route happens to be one of the shortest such possibilities. Grizzly Flat Trail is a fire road that descends for about 2 miles from Skyline Boulevard to Stevens Creek at a pretty steady grade of roughly 10%. It actually splits into two right at the beginning, but the two trails meet again twice before the end of the descent. I've only tried the left-hand option (Grizzly Flat North) at this split and I don't know of any features that differentiates one option from the other. The right-hand option of the trail (Grizzly Flat South) does seem to be less used and less maintained though, as well as being subject to more closures. (Grizzly Flat North is almost never closed.) 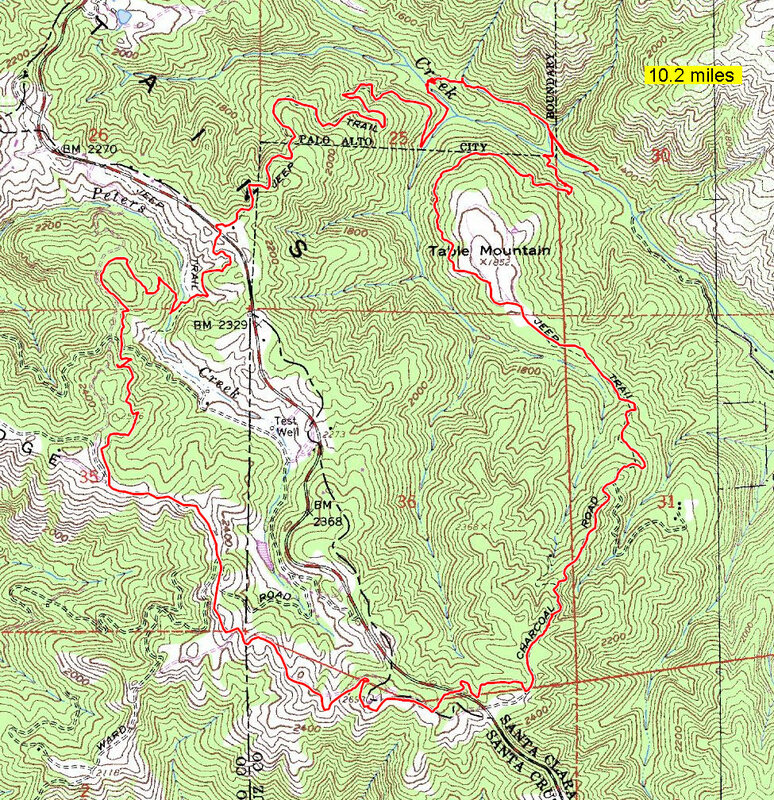 Overall, Grizzly Flat Trail is a non-technical fire road descent through nice woodlands. For a brief period just before (as well as shortly after) fording Stevens Creek, the trail turns into a singletrack. The portions of this singletrack immediately adjacent to the creek are pretty steep and technical, actually. But, once you reach Canyon Trail, you're back on a fire road, though an "aged" and partially narrowed one. Your next turn onto Table Mountain Trail comes up pretty quickly. (You may notice on the route plot that I've initially missed that turn on this particular ride.) This trail starts from a spot with a "ditch crossing" and a Palo Alto city limit sign, where you see a "side trail" descending from the fire road toward the right, to a creek crossing. Table Mountain Trail is a singletrack climb that starts on the other side of that crossing. It features some steep and very technical switchbacks, especially in its first part. It climbs for a mile and a quarter at 11% average grade, with the exception of a very short respite right near its halfway point. By the way, as with Charcoal Grade, bike traffic on Table Mountain Trail is allowed only in the uphill direction. Table Mountain Trail ends when you emerge onto a mostly flat fire road in a sparsely wooded area. This is the top of the "Table Mountain" from which the trail gets its name. From here, the route quickly leads to Charcoal Grade, which takes you back toward Skyline Boulevard. Charcoal Grade is roughly a one-mile climb that averages nearly 13% grade overall. However, what really gets you is the fact that it has short spurts that regularly exceed 20%. I'm pretty sure that at least one particular spot even reaches 30%. After Charcoal Grade levels out, you'll reach a junction with Saratoga Gap Trail, at which it's more fun to take a right turn and follow this singletrack to meet Skyline Boulevard rather than continuing straight on Charcoal Grade to the road. After crossing Skyline Boulevard, the ride enters Long Ridge Open Space, which is directly across from where you emerge onto the road. You can call this the "cleansing" part of the ride, because it doesn't see any substantial elevation change and actually enters a great series of singletrack trails after a short fire road segment. The singletrack here brings some mild climbing and descending, followed by a steep descent that's enough to get the adrenaline pumping of less experienced riders. Once that descent brings you to the Peters Creek bed, a left turn and a short climb takes you back to your trailhead. Of course, at the point where you finish Saratoga Gap Trail, you also have the option of heading straight back to your car via Skyline Boulevard instead, in case you're running short on time or energy. Your options for extending or modifying this route include taking Chestnut Trail (marked on some trail signs as "Ridge Trail") from Long Ridge to Skyline Ridge Open Space, taking Canyon Trail uphill after Grizzly Flat Trail to ride some of the trails in Monte Bello Open Space, or taking Saratoga Gap trail south from the end of Charcoal Grade. If you don't mind adding some riding on pavement, you can also omit Charcoal Grade and continue downhill on Canyon Trail until it turns into Stevens Canyon Road, which can take you to Redwood Gulch Road, and then to Route 9, to end up on Skyline Boulevard and return to your parking spot.